Living Social has an offer for a $60 gift certificate from Wine.com for $30. This is the first time I've tried to take advantage of an offer from Living Social. The way this one works is that you can buy the offer for $30 and then if three friends also take advantage of the offer yours is free. Other wine retailers have had trouble running half-off group buying deals in MA so we'll see how it goes. Update: Three people were kind enough to buy this deal through my link. Thank you! If you'd like to go in on this deal, feel free to pass along your unique code so that you can get the deal for free too. Wine.com has 1 cent shipping on orders of $49 or more today. Like this 2008 Belle Glos Meiomi Pinot Noir. They'll have revolving specials all week so we'll see whether the Living Social deal can "stack" with the Wine.com specials. A half-dozen Cyber Monday specials including the 2008 Owen Roe Sinister Hand for $19.99. Free shipping to MA with code "freeground". Local Piedmont specialists Vintages is having a unique Midnight Madness sale in conjunction with other retailers in Belmont. They're offering 20% off a new "shelf" of wine each hour tonight starting at 6 pm. Love it! Ironically, a local ordinance requires they close at 10 pm. A couple dozen Cyber Monday specials for your consideration. Prices posted now. They can't ship to MA, and their deals are listed via E-mail so I can't link to today's specifically, but I noticed today's special on an aged Zind Humbrecht so thought to suggest that you visit their website and sign up for their E-mail newsletter if you like wine deals and can receive wine shipments to your state. I'll update this page if I hear about other deals. If you're a retailer and would like your offer added E-mail me at wellesleywinepress@gmail.com. Any other deals you're hearing about? Leave a comment to share. Friday Only: 15% off a mixed case with coupon code BLACKFRIDAY. For example you could get the 2008 Caymus Special Selection for $84.99 (regularly $99) as part of a mixed case. Wine.com can ship to Massachusetts. 2006 Louis Jadot Vosne Romanee - regularly $56, on sale for $38 for an individual bottle. 10% off anything in the store -or- online with code "Turkey". Like this 6-pack of Blue Jay Ranch Pinot Noir - very good stuff especially for $9 a bottle. The last two times I've been there, they've had 2007 Ridge Monte Bello half-bottles in the bargain bins for $40. 10% off is $36 so the equivalent of $72 for a 750ml bottle of this wine. Based on a $145 release price, and a nationwide low price on Wine-Searcher.com of $99 I think this is a buy. Their inventory changes constantly so you never know what you're going to find! They'll pay the sales tax (save 6.25%) on Friday November 26th and every Tuesday in December. Items with prices ending in "4" are excluded from the tax savings deal. Click here to see their current ad. 25%+ off 400 select wines. Noted the 93WS 2008 Patz & Hall Sonoma Coast for $36 and 90+ Cellars wines at favorably low prices. Specials on wines from Cadence Winery, Burgundy, and 2009 Cru Beaujolais. 100+ items at huge discounts. Click here for more info starting at 9 AM EST on Friday. Wine Library cannot and does not ship to Massachusetts. Holding off until Cyber Monday: Click here to see a preview of their sale. $25 gets you $75 worth of wine from Barclays Wine. The selection looks like they're wine of the month club type retailer but have a look to see what you think. They don't ship to MA. Use this link if you want to kick back a $10 referral to my Groupon account. Use this link to go directly to the Barclays Wine deal. Any good public deals I'm missing? Which retailers have been offering deals you can't pass up lately? Group buying seems to be all the rage lately, and now Corkd is getting in on dishing out the deals. 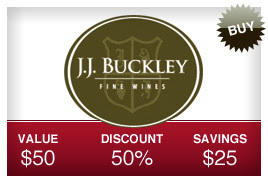 They're offering a $50 JJ Buckley gift card for $25. Click here to visit Corkd.com and check out the terms of the deal. Unfortunately, JJ Buckley cannot and does not ship to Massachusetts. You'll have to ship to a neighboring state to take advantage of this deal (or give the gift card to someone who lives in a state they do ship wine to). I can vouch for them being a reputable retailer as I've ordered from them in the past and had wines shipped to other states. The deals they offer are pretty incredible, and this deal makes those deals even sweeter. It just occurred to me as I was writing this up how cool this deal is. Why? Because Gary Vaynerchuk owns Corkd. And as a wine retailer (Wine Library and Cinderella Wine) he's effectively a direct competitor to JJ Buckley. Yet, he's allowing this deal to go through to promote another wine retailer. My guess as to why he'd do this? Because he loves the idea of pushing the retail envelope with a deal like this -and- he wants to see Corkd make a play as a wine deal hub. Pretty cool. 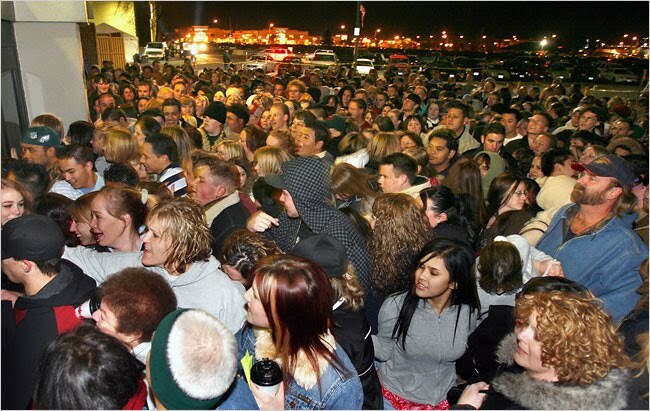 Wine Retailers: I'm compiling a list of Black Friday Wine Deals like I did last year. If you'd like me to mention your sale or offer drop me an E-mail and I'll include it in my list. The market for relabeled wines is growing and competitive. What is relabeling exactly? Well, when a premium winery bottles their wines they sometimes keep a percentage of production unlabeled so they can elect at a later date to sell the wine as their own -or- sell it to another company who places a different label on it and sells it as a different wine. This practice gives wineries a way to sell excess inventory without tarnishing their brand's reputation and polluting their sales channels with cut-rate inventory. The economic downturn that began a few years ago has been particularly harsh on the wine trade and value-hunting wine consumers, at least in the short run, have benefited from this process. There are some variations on the relabeling scenario described above. Sometimes it's the grapes, sometimes it's "the juice", and sometimes it's a finished bottled product that's being offered. Brands you may recognize as operating within some variation of this model include Cameron Hughes, 90+ Cellars, and Newman Wines. Banshee Wines aims to "deliver distinctive wines that beat the pants off many costing twice as much." I think they're pushing the pricing envelope within this model at $35 for a 2007 Napa Cab. I say it's pushing the envelope because there are some great 2007 Napa Cabs that can be had in this price range like the 2007 Honig Cabernet Sauvignon if you shop around. 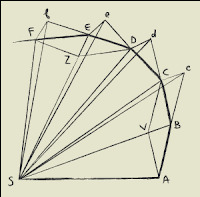 With a relabeled wine you forgo the connection with the original producing winery so I factor that into the equation when considering purchase of a relabeled wine. At $35, a relabeled wine needs to be really good to fly off the shelves. 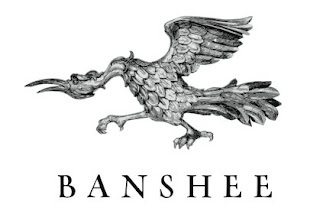 The 2007 Banshee Cabernet Sauvignon caught my attention because of recommendations from some of my must trusted retailers. I bought this particular bottle from John Hafferty at Bin Ends Wine in Braintree, MA. I stopped in a week ago trolling through the bargain bins (picked up some 2007 Ridge Monte Bello half bottles -and- some 2007 Gaja Sito Moresco at unbeatable prices) and he said he this wine was the best deal in the store. John tastes more wine in a week than I do in a year probably and especially since I love Napa Cab I took his recommendation and ran with it. I'm glad I did. When this wine became available to us, we were blown away by our good fortune. The winery where this gem was born has a flagship wine that releases for over $200 a bottle. It was made by one of the top 3 winemaking consultants in the world. The winery sold this exact wine with a different label for $100 a bottle. We bought all of the unlabeled bottles they had and are offering it for 1/3 of the price! This big Cab was made to go with a grass fed NY strip. Light up the grill baby! 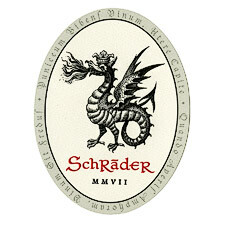 I found the Banshee label reminiscent of the Schrader Cellars "Old Sparky" label (below) and I think that's a good thing. If you don't have a Wine Spectator subscription I'd highly recommend setting aside some time to read this piece James Laube wrote about Fred Schrader while online access if free the next couple of weeks. For how powerful and utterly delicious this wine is on the palate, it starts off slowly. Visually, it's about 70% opaque. The nose only hints at what's to come - it actually smelled like a rather ordinary red wine to me. Some fruit, a little iron, a bit of earth. But on the palate, this wine is extraordinary, on the mid-palate in particular. It has a powerful mocha streak that I found stunningly attractive. Imagine an iced cafe mocha served in a pint glass with a streak of Hershey's syrup down the side. That's what this wine is to me. A beautifully framed Napa Cabernet wrapped around a core of delicious earthy chocolate notes with a finish that goes on for minutes. Highly recommended. I'd rate it higher if it somehow balanced out the deliciousness with just a touch more fruit or acid. But it's so good I'm willing to forgive it. Have you had this wine? If so, what did you think? Either way, how do you approach purchase decisions related to relabeled wines? Reminder: We're still running the Scoop the Spectator contest where you can win a $75 gift certificate for guessing their 2010 Wine of the Year. Check it out and lob in your guess now! 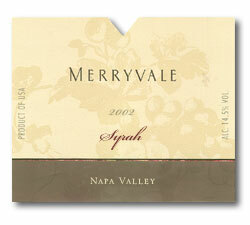 The 2007 Merryvale Profile is a red Bordeaux blend that retails for $150 and was rated 93 points by Wine Spectator. I think I've paid $20 a glass for the wine at The Capital Grille in the past. The winery produces a broad range of highly regarded wines including a $35 Syrah that was rated 92 points in 2006 and 90 points in 2007. As a value hunter, this kind of track record establishes Merryvale as a reputable producer I'd be interested in getting to know better. When I saw an offer from Blanchard's for the 2002 Merryvale Syrah for the unbelievably low price of $4.83 per bottle when purchased by the 12 bottle case I was skeptical. Skeptical about whether the wine was any good in the first place, whether it still had any life, and skeptical about how it had been stored since release. But at $55 a case - how bad could it be? It reminded me of the famous $4/bottle Tiz Red Bin Ends offered up last year that's served me incredibly well as a 3rd bottle to open when friends are over when nobody is interested in active assessment of the wine - but rather just one more glass of wine whatever it might be. A couple nights ago I had a highly regarded 2002 from Napa - a Switchback Ridge Merlot. 91 Points from Wine Spectator and a release price of $50. I caught it for $30 and thought it was fantastic. I thought this gave me a good framework for comparing this 2002 Merryvale Syrah. Dark in color. Nearly opaque. Slightly murky. Aromas of blueberries, blackberries, and violets. Great mouth feel - round and voluptuous. Just a touch of heat on the backend (it's 15.0% alcohol) but the finish is bright enough for me to say this still has a bit of enjoyable life. On the second night, this wine is even more impressive. Earthy aromas pair beautifully with ripe round fruit. Very impressive. This deal sold out in just a couple of hours. I share this tale with you to encourage you to get on Blanchard's E-mail list. It's one of the better lists in Massachusetts. It's almost time to roll-up the best wine deals of 2010. Here's my list from 2009 - I think I'll have even more to draw on this year. It's also almost time to take stock of the best wines of 2010. I have one in mind that's still haunting me and ironically I had it New Year's Day. Subscribe to the WWP so we can keep in touch. Where are you finding hyper-value these days? The $5 category at Trader Joe's? Closeouts? What's working well for you? I'd love to hear from you in the comments. 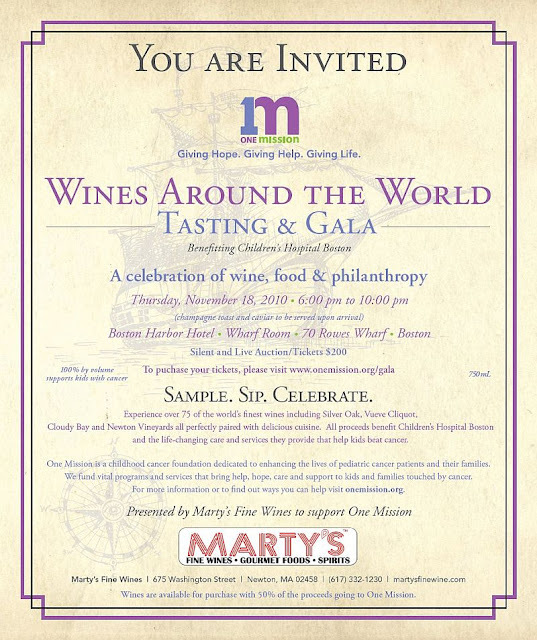 Here's an opportunity to enjoy an elegant night on the town to benefit a great cause - pediatric cancer patients and their families. Click here for more information about One Mission and this event specifically. This contest is sponsored by CSN Stores who sells everything from dining room chairs to wine aerators and Henckels Santuko knives. The winner gets a $75 gift certificate that can be used in any of their online stores. This is a great time of year for wine enthusiasts. The holidays are coming so we'll have opportunities to crack open those special bottle with friends and family. It's a chance to take stock of the year that was and think about which wines delivered the most excitement. Wine Spectator's Wine of the Year isn't necessarily the "best" wine they found in the past year. That would be too easy to identify - we'd just look up the wines they rated the past year, sort on rating, and flip a coin as to which 100 pointer should win. Rather, my view of the list is it's a list of wines that in their view defined the current state of the wine market. I think it's fun to think about which wine will win. Not so much because it's a wine you must have but rather because it's interesting to see how the market moves in response to the award being announced. Consider last year's winner the 2005 Columbia Crest Reserve Cabernet Sauvignon. Its release price was $27 and now sells at auction for $100. In short, if you can scoop the Spectator there's an opportunity to be had flipping wine! Well, unless you live in Massachusetts which is the only state in the union that you can't ship wine out of. I won't steal anyone's thunder by sharing my guesses - though there's been some chatter about this subject on Twitter. I hope we get a lot of entries because the prize is good -and- we'll wind up with some great QPR plays from the list of guesses. Leave your entry as a comment below. If nobody guesses the 2010 Wine Spectator Wine of Year, the guess with the highest position on the list will win the gift certificate. Contest closes Sunday November 14th at 11:59pm because Wine Spectator starts revealing the Top 10 Monday November 15th. Bonus: WineSpectator.com is opening up for free access to their articles and ratings November 15-28 so if you're not a subscriber this is a good chance to see whether you'd find an online subscription useful. 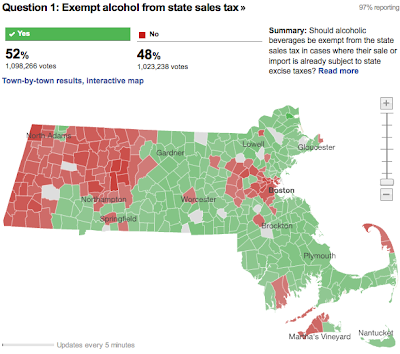 Massachusetts Voters Repeal Alcohol Sales Tax: What Happens Next? The initial returns didn't look promising, but on a night expected to be filled with tight races, one actually ended up being close. By a 52%-48% margin, voters said "yes" to Massachusetts Question 1 which would repeal the sales tax on alcoholic beverages (full story from WBUR). If enacted, this means that sales tax on beer, wine, and spirits will return to it's pre-2009 rate of 0% from its current rate of 6.25%. I watched the returns closely all night and found them fascinating. Looking at the map above, larger cities generally voted in favor of keeping the tax while smaller towns voted to repeal it. Meanwhile, the eastern part of the state wanted to repeal the tax while the western part of the state wanted it maintained. I'm still thinking about what exactly those trends imply in terms of public opinion but at the same time I'm looking forward to the future. When will the alcohol tax repeal take effect? When the tax went into effect last year it took one month from when Governor Patrick signed the bill into law and the tax started being collected. Something tells me this will be like credit card charges: Applied almost instantly when it's a purchase but seemingly takes forever when it's a refund. You can bet retailers and consumers will be anxious to see this take effect, especially since we're entering the busiest time of the year. I look forward to putting a sales-tax-free bottle of wine on our holiday table. Update: According to @CurtNickisch from WBUR the sales tax is set to be removed January 1st, 2011. Will the excise tax be increased? I suggested in this piece that if the intent of the alcohol sales tax was to discourage excessive consumption, the right thing to do is to increase the excise tax. Whether that was indeed the intent is unclear, but we'll see if an excise tax increase comes along with the alcohol tax being repealed. Might the state legislature ignore the result and decide not to repeal the alcohol sales tax? I guess that's possible one way or another. It wasn't like they asked our opinion when they put the tax in place last year. We shall see, but I hope it's not like when courts decided earlier this year that wineries should be able to ship wine directly to Massachusetts consumer only to have the state legislature utterly fail to take the common sense action of passing a direct shipping model bill. If I live in another state, can I buy wine from Massachusetts tax-free online and have it shipped to my state? MA retailers can't legally ship out of the state so if you find a MA retailer who ships out of state they're probably doing so illegally. That being the case I find it unlikely that they'd remit taxes to your state. It's also illegal to import or export wine into the state so you can't technically come here and buy wine to take home. Nobody has ever been formally cited for this act that I'm aware of, but just so you know. What's going to happen to the behavioral health services the sales tax funded? I don't know. During the campaign, there was disagreement on whether the alcohol sales tax exclusively funded these programs or whether the sales tax went into the general fund. I never gained full clarity on how exactly these programs were funded prior to (and after) the alcohol sales tax was in place. My guess would be it will revert back to its prior state of funding which I assume came from the general fund. Another thought: Since we have mandatory health insurance in Massachusetts might it make sense to include behavioral health services in the health insurance mandates? Thanks to everyone who voted yes on this question. And thanks to everyone who engaged in an enlightened discussion about the issues even if you came to a different conclusion than I did. It was a complicated question and to be honest I'm surprised it passed. The "no" vote enjoyed the equivalent of an incumbent's advantage because when people are confused by a question (and it was a confusing issue especially as stated on the ballot) the default response is to say "I'm not convinced: No." Let's hope this is the beginning of a series of wine enthusiast-friendly changes in Massachusetts. Pair this with freeing up some shipping laws and creating more competition at the distributor level and we could be on to something. Let's hope! Here's to buying some sales-tax-free wine in the near future. Stay tuned for answers to these questions. I'd love it if you subscribed so we can continue the conversation. Learning how to help an alcoholic can be quite useful, especially when you have friends or loved ones who drink alcohol excessively.